Grab free lego toys worth £10 from Lego shop. 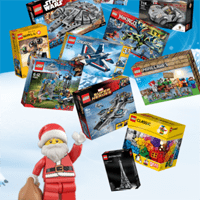 Just visit their website and choose any lego toys of worth up to £10 and you will get them for free. This will be an excellent present for your kids on Christmas. Click on “GET IT HERE” button and then register for a free account on TopCashBack website and then follow their link to Lego site. Purchase the toys and then get a full cashback from TopCashBack.